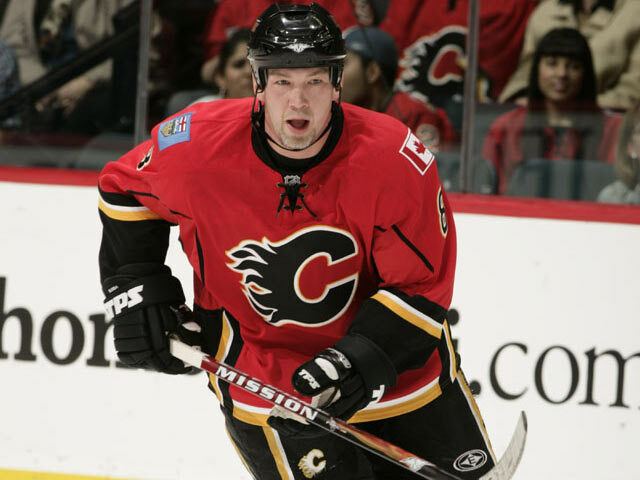 CALGARY, Alberta (AP) -Jarome Iginla is heating up just when the Calgary Flames need their captain the most. 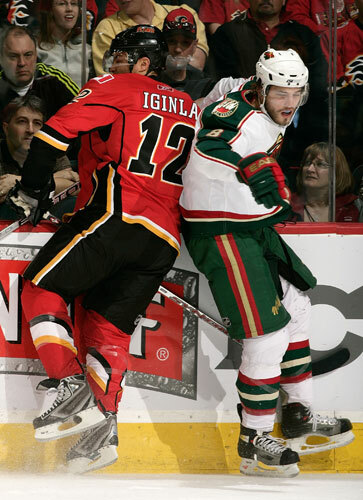 Iginla notched his seventh NHL hat trick, and the Flames beat the Minnesota Wild 5-4 in a key Northwest Division clash on Saturday night. The Flames captain tied it 2-2 with 23 seconds left in the second period, put the Flames ahead 50 seconds into the third, and scored his 48th of the season at 6:47. "It seems like everything that's touching Iggy's stick right now is going in, so I was trying to keep passing to him," said Alex Tanguay, who set up the go-ahead tally. Minnesota got a pair of goals later in the period from defenseman Kim Johnsson but Matthew Lombardi's goal in-between proved to be the difference for the Flames. Calgary moved within one point of the Wild, who lead the division. "A high-scoring game like that is a little out of the ordinary, but at this time of year, any style of game, you have to win it," Iginla said. "These are playoff-style games. We want to keep rolling and feeding off of these games, they're big momentum boosts." Iginla's third goal came when he wristed a rebound past goalie Josh Harding after Dion Phaneuf's shot from the blue line hit a crowd in front. The game was delayed for a few minutes as the numerous hats that showered down onto the ice were collected. Shortly after the game resumed, the sold-out crowd broke into chants of "MVP, MVP" in salute to Iginla. Phaneuf also scored for Calgary, 6-0-2 at home in its last eight. Benoit Pouliot scored his first two NHL goals for Minnesota, which lost in regulation for the first time in eight games (3-1-4). 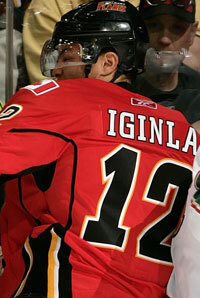 Iginla's first of the night came just 1:13 after Pouliot's second goal gave Minnesota its first lead of the game. Wild coach Jacques Lemaire was unhappy with the amount of room Iginla had to operate most of the night. "When he's around the net, he's dangerous, you have to check him," Lemaire said. "We let him go to the net alone, he gets a rebound, he puts it in. On another goal, he gets a rebound, he puts it in. The other time, he's right in front of the net and nobody makes an effort to go and check him. I guess they don't know that he's got 48 goals." Pouliot had tied it 1-1 at 13:12 of the second. Breaking in on a 2-on-1 with Brian Rolston, Pouliot's attempted pass across deflected off the skate of defenseman Cory Sarich and squeaked between the pads of Miikka Kiprusoff. Calgary took a 1-0 lead three minutes into the second on a highlight-reel, short-handed effort by Phaneuf. Picking up a loose puck deep in his own end, Phaneuf weaved his way up ice. As Phaneuf went around Brent Burns and moved toward the net, he moved with just his right hand on his stick. He managed to flip the puck over Josh Harding's pad before sliding into the end boards. Notes: Minnesota RW Mark Parrish was a healthy scratch for the second straight game. ... It was Phaneuf's first NHL short-handed goal. ... Minnesota wrapped up the last of 15 back-to-back games with a record of 9-4-2 in the second game. They were 9-5-1 in the first. ... After getting a season-low 6:03 of ice time Thursday against Colorado, Calgary LW Kristian Huselius played just 6:32.